When you need a dumpster rental to help with the cleanup around your home or workplace in Ravena, NY, and the surrounding areas, including Albany, Rensselaer, and Greene counties. 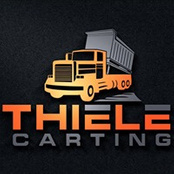 You can count on Thiele Carting and Plowing LLC to provide you with a variety of different size options to meet your needs. Before you know it, you'll be enjoying a decluttered space free of trash and junk. If you need a little extra help clearing away things like larger structures, we also offer demolition services in Ravena, NY, Albany, NY and the surrounding areas. We are your one-stop shop for getting rid of the things you no longer want. Rent a roll-off dumpster today and say goodbye to your junk. Choose from a variety of different dumpster sizes. Do away with unwanted residential structures. Make sure your sidewalk or driveway is free of snow this winter. Clear the way for your new construction project. Seek dumpster rental and demolition services in Ravena, Albany, NY, and the surrounding areas. Are you sick of trash and debris piling up with no place to put it? A roll-off dumpster rental is the perfect solution to your problem and could save you a ton of time in the long run. A roll-off dumpster is a convenient option for trash removal because as soon as you're done filling it with junk, we'll haul it away! Thiele Carting and Plowing LLC proudly provides dumpster rental and demolition services in Ravena, NY, Albany, NY and surrounding areas, including Albany, Rensselaer and Greene counties. Get in touch with us today to learn more about our dumpster rental and demolition services in Ravena, NY, and Albany, NY. Effective demolition services in Ravena & Albany, NY, and the surrounding areas. A dumpster rental can be an ideal solution for many different projects in Ravena, NY and the surrounding areas, including Albany, Rensselaer, and Greene counties. With different size options, you're sure to find a container that is right for you. If your project requires the removal of large structures, you can also take advantage of our demolition services. Call today to schedule your demolition project or get a roll-off dumpster rental in Ravena, NY, and the surrounding areas.